This hydraulic four column press from RHTC has a force of 80 ton is built with four cylindrical columns to guarantee perfect alignment of the upper table. The size of the table of this 80 ton four column press is 1.150 x 770 mm, it has a vertical light of 600 mm and a piston stroke of 450 mm. 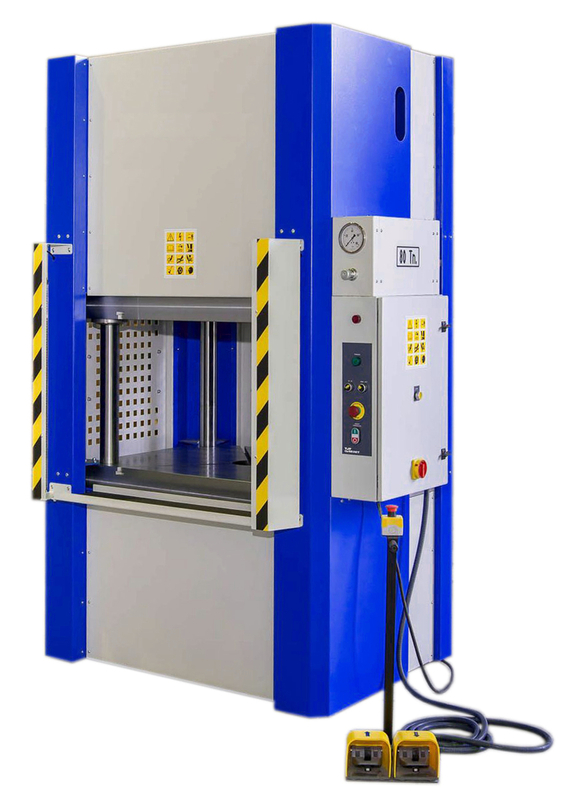 These hydraulic presses have a two-speed hydraulic unit with a selector for selecting the fast approach speed or lower press speed and a selector for selecting a manual of semi-automatic operation. Furthermore, this four column press is equipped with a manometer in tons, a pressure regulator and low-voltage pedals for the operation of the press. All four column presses from RHTC comply with the latest CE-regulations, are made in Europe and have a warranty of two years. These hydraulic presses can be delivered with several options, so please do not hesitate to contact us when you need some more information.